Discussion in 'Amps and Cabs' started by zebrapup, Apr 17, 2016. MantraSky, Jim S, MCSS1970 and 9 others like this. I can't say enough about Charley, Jorg and the entire crew at Bogner. This amp is so good. Raw, open, crunch, sizzle, sustain. I've spent more time on the clean channel with this amp than I have with almost any other amp. So many incredible tones in this thing. I just wanted to give them a shout on this forum, and tell you guys, if you're looking for any Marshall tone, it's in here. And for me having the two channels for gigging is ideal. Just can't say enough. Thank you Reinhold and everyone at the shop. dangeroso, Steve Snider and dwoverdrive like this. The Youtube demos of this amp sound freakin' awesome. I'd love to pick one up but there are none to be found on the used market here in Canada. Really think they should make a mini-jubilee version of this. Awesome in purple! Love my Helios too. Thanks guys. Mini jubilee. I laughed when someone told me about the la grange pedal being a Helios in a pedal. A list of amps I married and divorced... ADA MP1, Mesa Mark IV, 5150 peavey block series, Mesa stiletto, 1978 JMP 50 with matching 412(it blew up), Budda 30 watter, Suhr badger 30, egnater renegade, 1987xl reissue with loop, splawn quick rod, pink taco, chupacabra 50 and now the Helios. There were others but not notable enough to mention. Helios wins. Bogner has their stuff together. Sweet amp! Solid, the switch came with the amp. I didn't want to get into the entire saga of my acquisition, but I'll tell you the first amp arrived at my door in pieces due to poor non factory packing, and UPS ineptitude and carelessness. 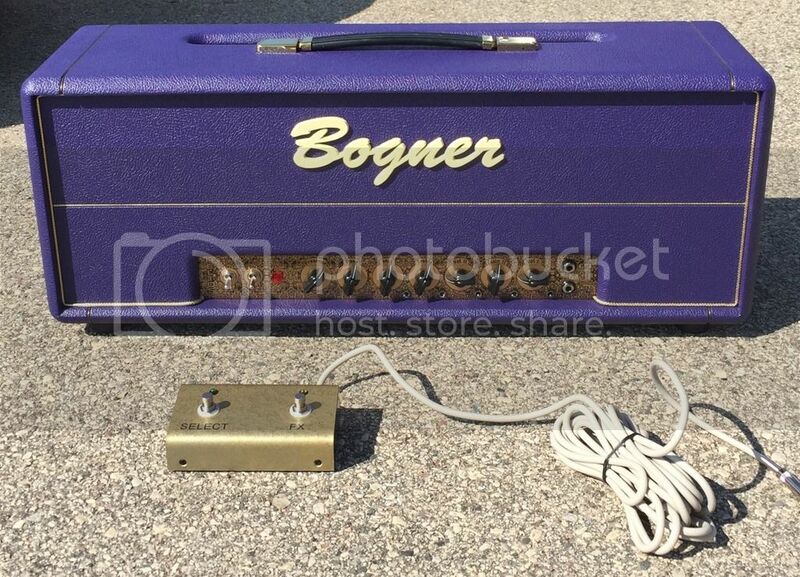 After returning the destroyed amp to the dealer, I made bogner aware of what happened with photos and what not. Charley and Jorg were horrified when they saw the pics and suggested drop shipping a new one. I was thrilled and asked about the switch and the color option. They were more than happy to oblige. Went way above and beyond as the issue was clearly the dealer's and UPS'. coolfeel, Kentano2000, Echoplexi and 1 other person like this. awesome looking amp. I am also thinking about going the bogner route and getting a 20th anniversary XTC. I hope that amp is all I am looking for. Everything I've heard about their customer service is in line with your experience. My helios sounds awesome, but it's always great to hear when a company goes the extra mile for their customers. That purple is sick, by the way! Yeah, the Helios sounds fantastic. Loved mine, but went back to an Ecstasy. Sheesh the purple is incredible. We played my Ecstasy Classic back to back with this amp and pretty much came to the conclusion that the Classic=refined, sort of like the mic'd track of the Helios put through a compressor and some post production while the Helios was pure, tight, raw grunt and kerrang. Every bit a perfect Marshall but with some of the Bogner mojo. Just a fantastic amp! Love my Helios 100. It's a killer amp. It sounds like it's cranked, even at low levels. Steve Snider, 58flame and zebrapup like this. Well, the Helios' first gig is history... What a liberating and exhilarating experience. The dynamics and immediacy of the amp are what I've been after all these years. Every inflection of my hands is rewarded or reprimanded in some cases. Pick angle, thumb flesh, left hand chirps between chords, an amp that doesn't let me get sloppy or lazy, and again rewards my increased effort. Just so thrilled with it. So happy with the purple. Gotta chime in here too. I have the Helios 50 and yeah it's just the best do it all Marshall style amp I've ever played. The master is the best I've ever used. I think I mentioned it in another thread that it doesn't sound better louder, it just gets louder. Love the plexi input. Many have mentioned that it doesn't get very dirty with that input which is true but I hit it with a boost or compressor with the EQ at the 11 setting and it sounds dang close to my old metal panel 74 but warmer. Then you have 70s mode that depending on gain setting will do just about anything up to 80's metal, and then there's the 80's switch for that. I can get great Priest tones by running only a chorus into the front, everything from British Steel in 70s mode through Painkiller in 80s' mode. Just one example. I ended up preferring the Helios over many Marshall like boutique stuff including Friedman. It just sounds so right to me. BoogieManSC and Steve Snider like this.